Volkmann, a market leader in vacuum conveying, offers the following videos to address pneumatic conveyor solutions for the chemical, food, pharmaceutical and nutraceutical industries. See in one minute what Volkmann Pneumatic Vacuum Conveyors can do for you. This video shows a Volkmann vacuum conveying system transferring seeds in dense flow conditions clearly demonstrating the product flow from point to point. Powtrex is Volkmann’s unique metal powder aspiration, transfer, screening and recovery system designed for metal additive manufacturing (AM). It offers reliable and safe operation with all AM metal powders including stainless steel, aluminum, titanium and others. Powtrex offers high material throughput on a very small footprint. HEPA filters included, explosion safe. 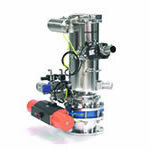 Closed Loop and inert systems available. This video introduces Volkmann Vacuum Conveyors, demonstrating their capability to provide plug flow transfer in a dense phase vacuum conveying mode achieved as a result of high levels of vacuum based on their pump pulling as low as 28 inches of mercury. This results in lower product velocity, unlike conventional vacuum systems which can move material at 60 mph, making sure your product arrives without segregation, damage or abrasion. The Volkmann VS Series, their general purpose range of vacuum conveyors, offers product transfer without segregation, damage or abrasion and all units are ATEX Certified. Company President, Nick Hayes, demonstrates how easy it is to disassemble, clean and assemble Volkmann’s line of vacuum conveyors with no tools greatly facilitating product line changes in factory conditions. All conveyors are made of stainless steel parts and offer interchangeable seals avoiding any confusion in assembly. This range of Volkmannn vacuum conveyors is geared specifically to the pharmaceutical industry. The distinction is that the body of the unit is one piece. No joins make it extremely easy to clean. Company President, Nick Hayes, demonstrates how easy it is to disassemble, clean and assemble these ATEX Certified units made with stainless steel parts. This video was filmed at the 2012 PTXi Show and highlights the capabilities of Volkmann’s line of VS and PPC vacuum conveyors. These systems provide dense phase vacuum conveying with no product segregation or damage as a result of the low velocity high vacuum used for product transfer. A plug flow transfer is exhibited. Company President, Nick Hayes, demonstrates how easy it is to disassemble, clean and assemble Volkmann’s line of vacuum conveyors with no tools greatly facilitating product line changes in factory conditions. All conveyors are made of stainless steel parts and offer interchangeable seals avoiding any confusion in assembly. This video demonstrates how it is possible to vary the conveying mode from lean to dense and on to plug flow by controlling the air inlet to a vacuum conveying system. The leaner the conveying, the greater the air inlet required and the faster the conveying velocity. Conversely, to minimize segregation, abrasion and degradation, the slower the velocity – requiring a vacuum pump capable of pulling high levels of vacuum – the less input air needed.